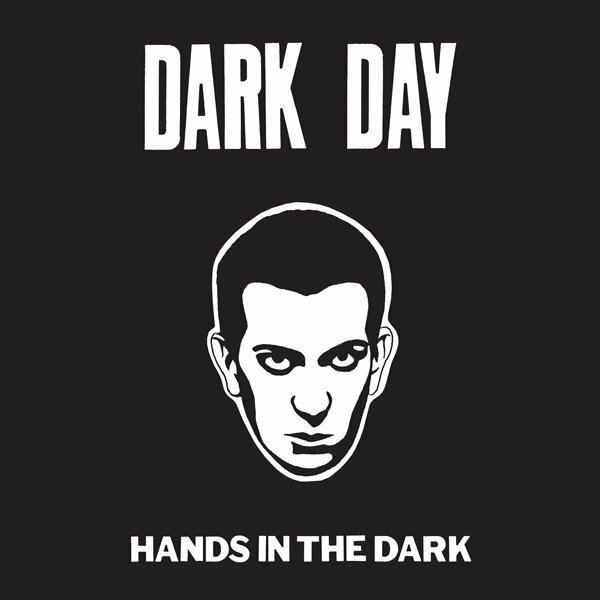 Dark Day - Hands In The Dark EP 12"
Dark Entries continues to work in reverse chronological order to re-issue Dark Day’s debut single “Hands In the Dark.” Dark Day is the minimal electronics brainchild of Robin Crutchfield following his separation with no wave band DNA. For the first incarnation of Dark Day, Robin recruited Nina Canal from The Gynecologists and later UT on guitar and Nancy Arlen from Mars on drums. . They recorded two songs for a 7" single, released in 1979 on Charles Ball's Lust/Unlust label. Off-kilter jerk-like guitar and energetic acrobatic tom-tom tumbling fuse with queasy lurching keyboards and “cold medicine” vocals. This single stepped away from no wave towards what was going on in the U.K. with The Normal, Robert Rental and Throbbing Gristle. After this single Dark Day would regroup with Robin on synthesizers and vocals, Phil Kline on guitar, Barry Friar on drums and guest Steven Brown of Tuxedomoon on saxophone to record the "Exterminating Angel" album. 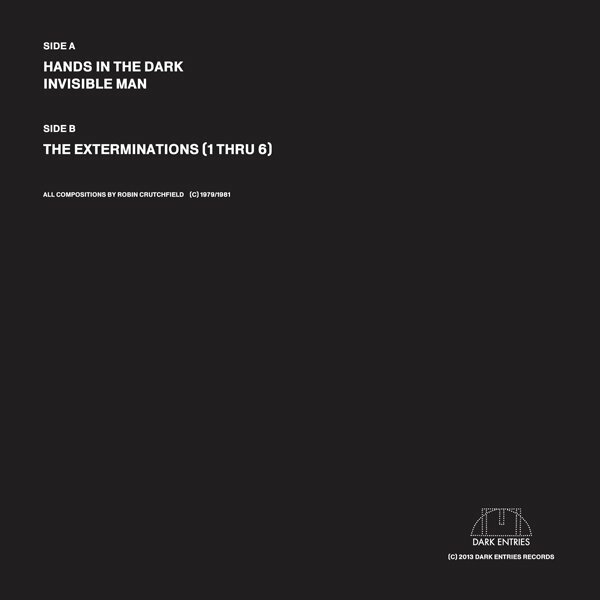 In 1981, the song "Trapped" was released as a 12" EP backed with "The Exterminations (1 Thru 6)." For these six instrumental tracks, Robin went back into the studio with the master tapes, flipped them over and played them backwards. Altering track assignments, speed and reverb effects, he rode the faders in and out, creating short “exterminations” of the original songs. The result is Crutchfield's favorite Dark Day release. All songs have been remastered from the original reel to reel tapes for vinyl by George Horn at Fantasy Studios in Berkeley. 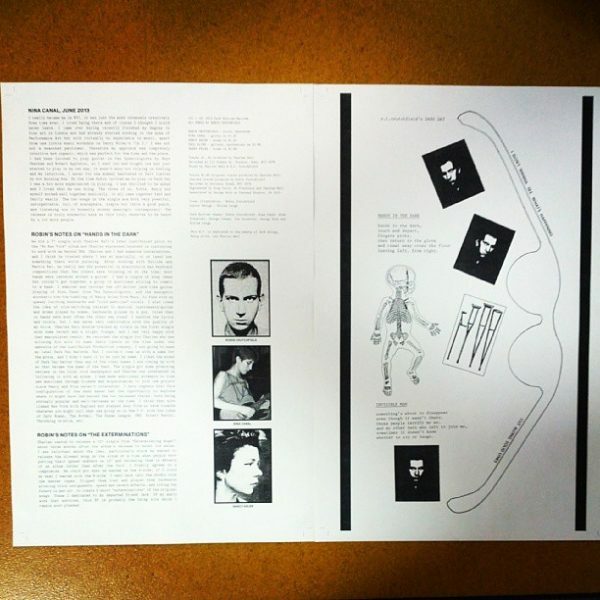 The vinyl comes housed in jacket featuring a self-made cartoon of Robin Crutchfield to announce the release of the 7" in 1979. Each LP includes a double sided 11x17 fold-out poster with lyrics and photos and song notes by Robin and Nina Canal. Dark Day continue to inspire the current wave of stark, eerie, processional synthesizer music more than 30 years later.